When attending the April 26, 2012, Cleveland Digital Publishing Users Group (www.CDPUG.org - @CDPUG) meeting led by Spike Radway (www.TeamSpike.net - @SpikeRadway) on Presentation Skills for the Graphic Designer, who would have thought I would be truly surprised . . . but I am getting ahead of myself. I will get to the pleasant surprise shortly. The meeting took place at New Horizon Cleveland (www.NewHorizons.com/Cleveland - @NewHorizonsClev - @NewHorizonsCLC) and I want to take this opporunity to thank them for increased involvement in supporting Cleveland tech meetings in recent years. There are several meeting taking place each month at their location. Watch my weekly Cleveland technology and social media announcements on this blog for these meetings. Spike Radway, CDPUG Director of Programming (and witness to 25 years of CDPUG presentations), will advise and help members prepare for the 8th Annual CDPUG Showcase on Thursday, May 31st. The public speaking and presentation skills covered will not only help those submitting Calls for Entry, but also help anyone that needs to visually promote their skills and services to new and existing clients. 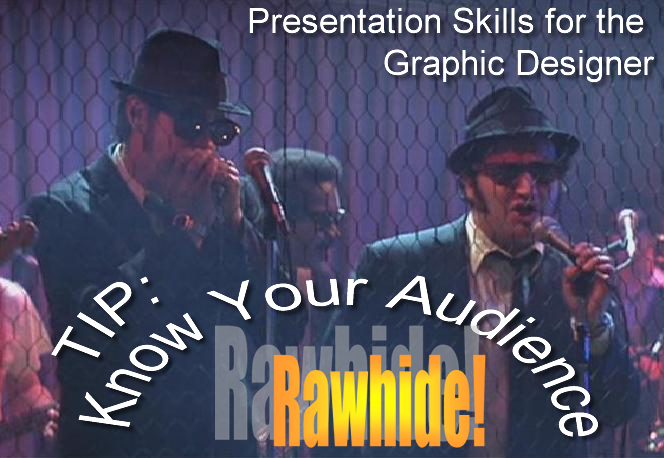 Tried and true presentation concepts will be covered including many do's and don'ts. Basics of Apple Keynote will be included, along with a demonstration on how to properly prepare images for use in the 5-Minute Portfolio format of the 8th Annual CDPUG Showcase, held on May 31st. 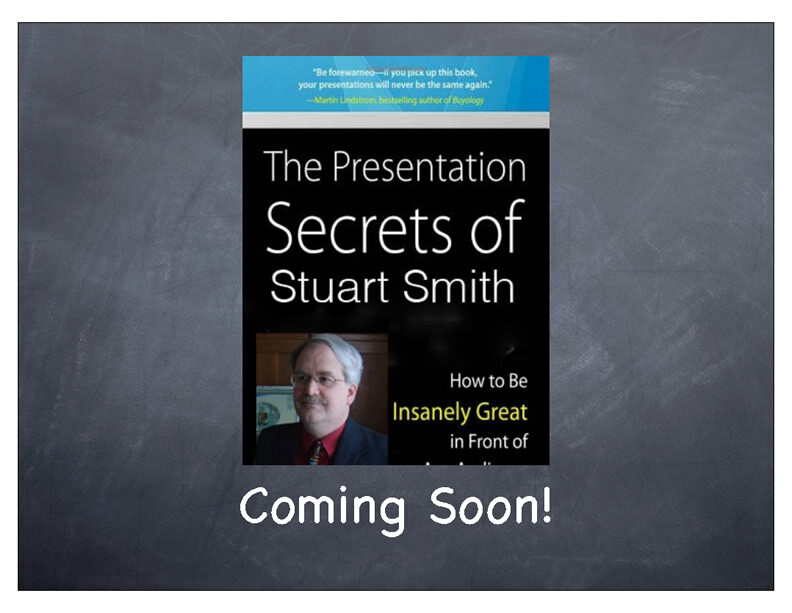 At the Showcase, you can share your best work, your specialties, and who you are, using 20 slides that auto-advance every 15 seconds for a total of five high-energy minutes. Spotlight your individuality and creativity! It’s a cool and easy way to introduce yourself to your peers, make new contacts, and gain important referrals. 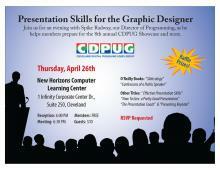 Spike Radway, is a founder of CDPUG and has been hanging around since 1987. Currently serving as the CDPUG Director of Programming, Spike has held many positions on the board including president twice. He prefers the job of scheduling knowledgeable speakers on interesting topics. When not pursuing programming for CDPUG, Spike owns and operates a Macintosh Consulting and Support Business helping clients choose new Mac products and keeping those that are already in use backed up and functioning properly. “Ignite is a global event, organized by volunteers, where participants are given five minutes to speak about their ideas and personal or professional passions, accompanied by 20 slides. Each slide is displayed for 15 seconds, and slides are automatically advanced. The Ignite format is similar to Pecha Kucha, which features 20 slides displayed for 20 seconds each. 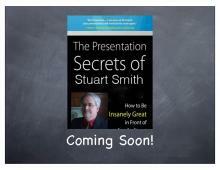 The presentations are meant to "ignite" the audience on a subject, i.e. to generate awareness and to stimulate thought and action on the subjects presented." Since I really enjoy the Cleveland PechaKucha events (www.pecha-kucha.org/night/cleveland - @PechaKuchaClev ), I love that CDPUG is using the Ignite method of presentation at their annual May meeting where they focus on members' portfolios. Spike kicked off the meeting with stating the importance of knowing your audience. The humorous example he gave was from the 1980 movie, The Blues Brothers. 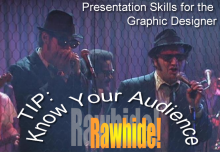 Like Elwood on stage, you need to know your audience – so drop the blues, and give them Rawhide! Ask questions of the audience – Start the meeting by determining the knowledge level of your audience for your topic. Make adjustments if necessary – If, after reviewing the venue and the knowledge of your audience, be prepared to adjust your presentation. As a former Scout leader, I know well the next point of Spike's presentation: Be Prepared! USB Flash Drive – I can tell you that, the last two times I did presentations, in addition to having a copy of my presentation on my laptop, I had a copy on a flash drive I brought to the meeting. I also confirmed that someone at the meeting had the software (such as Microsoft's PowerPoint or Apple's KeyNote) that I needed for my presentation. It is often also important to be sure that the person has the correct version of the software. Drop Box (www.DropBox.com - @Dropbox) - Lets you share your files between your different devices anywhere you have internet access, so you always have a backup and multi-device access. It starts with 2 GB of free storage, and you can earn or purchase more. A file you save to your Dropbox will automatically save to all of your computers, smartphones and the Dropbox website. You can also easily share files with other people. Lets you stand out in a competitive market. The real surprise for the evening was when Spike Radway for recommended me as an expert on presenting and showed the following slide in his presentation. Thank you, Spike, for the compliment!!! I originally recommended Apache Open Office (www.OpenOffice.org/ - @OpenOfficeOrg) as a free presentation software, but after sharing this on Twitter, I received coments from @flywheeltech and @jrgifford recommending LibreOffice (LibreOffice.org - @LibreOfficeNews ) as a better, updated version. I have not tried the Presentation feature of LibreOffice, but since using the Text Document feature, I do like it more than Open Office. I pulled in the sample of Impress.js into an iframe. If you click on this Impress.js demo first, you should be able to use the arrow key/spacebar to go through the demo on a modern browser. 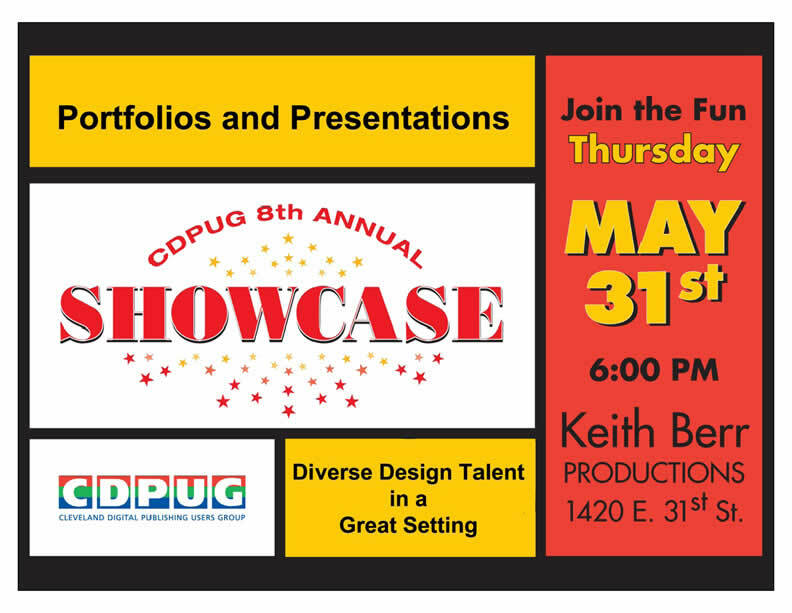 After Spike Radway's meeting on how best to do presentations, I highly recommend that you attend the May 31st CDPUG Members Showcase. It is always a great time to learn about some of the talent we have here in Cleveland. I would also suggest that if you have something visual to share, then join CDPUG and sign up to do a presentation at a future meeting. 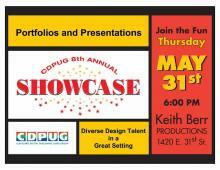 Here are driving directions to Keith Berr Productions, Inc. and the CDPUG May Members Showcase meeting details. Thanks for all the @CDPUG members who shared via Twitter during @SpikeRadway presentation. "Why and How to Give an Ignite Talk" j.mp/JJZvSs via @SpikeRadway at @CDPUG mtg on presentation skills. Sorry U missed. RT @4debbiekennedy: Thx @sos_jr for the @CDPUGmtg updates. Couldn't make it tonight, Ifollowed your tweets for info. Thx. Will check out-> RT @flywheeltech: @hkass @sos_jr @CDPUG @openofficeorg libreoffice is much faster and more stable than openoffice! @sos_jr @CDPUG @openofficeorg It's great for the price. Compatibility with MS Office is sometimes a problem for me. Please feel free to add your own presentation ideas to the comments section below!